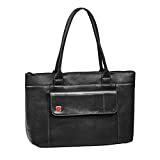 The stylish lady’s bag for laptops up to 15.6″. The bag is manufactured of high-quality PU leather to protect your laptop from possible damage. The bag has 2 inner pockets for documents, accessories and Tablet up to 10.1″. Front pocket with magnetic clasp for mobile phone, business cards, accessories. This entry was posted in Luggage and tagged 15.6inch, 8991, Laptop, RivaCase by Perfect Vacation. Bookmark the permalink.